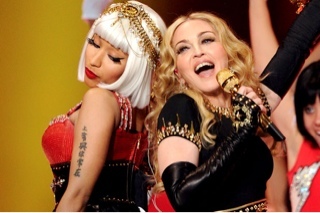 The Queen of Pop made a comeback on yesterday's Super Bowl performance. She had performed five or more songs one of which is her new lead single "Give Me All Your Luvin'" from her upcoming album "MDNA." According to Billboard, after three days of the songs digital release it has recorded 100.000 downloads while her album has reached the 50,000 pre-order mark. Her sales though is down compared to her last single "4 minutes", which has sold 217,000 downloads on its first week. Not only her new material boost up sales, her compilation album "Celebration" and other albums have collectively increased sales by 1,700% thanks to her wicked performance at the Super Bowl. Madonna's "Give Me All Your Luvin'" will debut on this week's Billboard charts while her 12th studio album will be released on March 26 via her new record label Interscope.